Christina Romer has an Op-Ed on U.S. monetary policy that raises several important points. First, she does a good job explaining that monetary policy can still pack a punch even when short-term interest rates are close to zero. She reminds us that unconventional monetary policy during the Great Depression–the original QE program–did wonders for the economy in a far worse economic environment than today. If it did such an incredible job back then, why couldn’t it do the same today? This is a point I made late last year to Paul Krugman. It should encourage folks like him and Mark Thoma to be more optimistic about what monetary policy can do to shore up the recovery. I don’t like this division. It creates the impression that all empiricists don’t use foward-looking theory to asses their reading of the data. Far from it. Take, for example, the core inflation measurement mentioned above. The only reason policymakers look to this is because it provides an indicator of where trend inflation is headed. Also, many empiricists look to explicit forward-looking market measures found in various assets prices. The most obvious one is the expected inflation series that comes from the spread between yields on nominal and real treasury securities. Empiricists are looking to these forward looking measures and see no runaway inflation on the horizon. 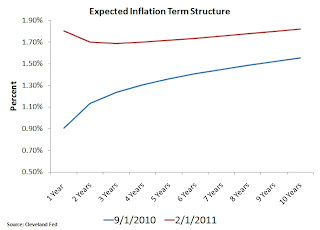 For example, below is the expected inflation term structure–the expected inflation rate across various forecast horizons–from the Cleveland Fed. This data is a cleaned-up version of the expected inflation series implied by treasury securities. This figure shows that since QE2 1-year inflation expectations have gone from 0.90% to 1.80% while 10-year inflation expectations have gone from 1.55% to 1.82%. 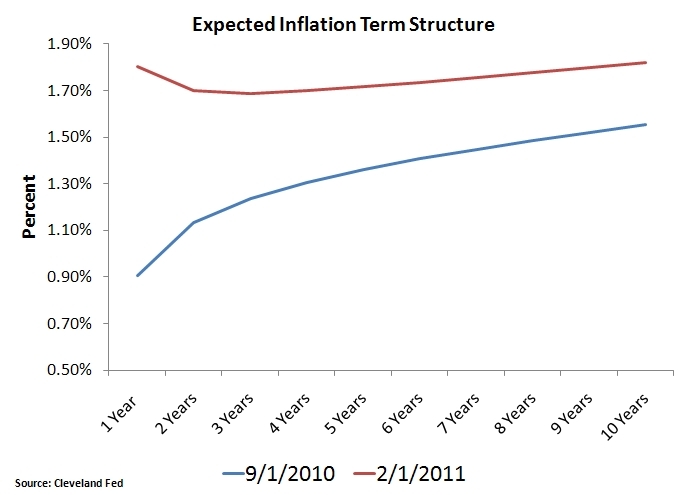 These numbers are low relative to the implicit 2.00 to 2.50% inflation target of the Fed. Empiricists care about these indicators because they understand the importance of keeping them anchored. So far, though, there is no sign of them becoming unanchored. If any thing, the theoretically-driven empiricists see a reanchoring of inflation expectations that is pulling them down and preventing a more robust recovery. So what is the solution? Christina Romer suggests a price level target. It would be a vast improvement over QE2 in terms of efficacy and it would add more long-run certainty. However, for the reasons outlined here, an even better alternative would be a nominal GDP level target.